Adi Shankara (Malayalam: ആദി ശങ്കരന്‍, Devanāgarī: आदि शङ्कर, [IAST] Ādi Śaṅkara, pronounced aːd̪i ɕaŋkərə); (788 CE - 820 CE), also known as Śaṅkara Bhagavatpādācārya and Ādi Śaṅkarācārya, was an Indian philosopher who consolidated the doctrine of en:Advaita Vedanta, the most influential sub-school of Vedanta. 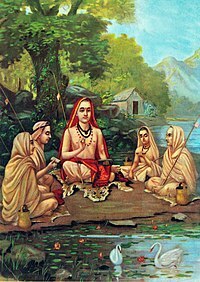 His teachings are based on the unity of the en:jiva and en:Brahman, in which Brahman is viewed as en:Nirguna Brahman. He hailed from Kalady of present day Kerala. Media in category "Adi Shankara"
This page was last edited on 26 December 2018, at 07:48.